The Lawnmower Man is a 1992 science-fiction action-horror film directed by Brett Leonard and written by Leonard and Gimel Everett. The film is supposedly an adaptation of the Stephen King short story of the same name, but aside from a single scene, the two are completely different. The film stars Jeff Fahey as Jobe Smith, a simple-minded gardener, and Pierce Brosnan as Dr. Lawrence Angelo, the scientist who decides to experiment on him. The film was originally titled Stephen King's The Lawnmower Man, but King successfully sued the producers for attaching his name to the film and stated in court documents that the film "bore no meaningful resemblance" to his story. An earlier short film, also titled The Lawnmower Man, is a more faithful adaptation of the short story. It was directed by Jim Gonis in 1987. A sequel, Lawnmower Man 2: Beyond Cyberspace, was released in 1996, with Austin O'Brien as the only returning actor from the original film. Dr. Lawrence Angelo works for Virtual Space Industries, running experiments in increasing the intelligence of chimpanzees using drugs and virtual reality. One of the chimps escapes using the warfare tactics for which he was being trained. Dr. Angelo is generally a pacifist, who would rather explore the intelligence-enhancing potential of his research without applying it for military purposes. His wife Caroline is unhappy with the way he is ignoring her to focus on this project. Jobe Smith, a local greenskeeper with an intellectual disability, lives in the garden shed owned by the local priest, Father Francis McKeen. McKeen's brother, Terry, is a local landscape gardener and employs Jobe to help him with odd jobs. Father McKeen punishes the challenged Jobe with a belt and "Hail Marys" whenever he fails to complete his chores. Dr. Angelo realizes he needs a human subject to work with, and he spots Jobe mowing his lawn. Peter Parkette, Dr. Angelo's young neighbor, is friends with Jobe. Dr. Angelo invites both of them over to play some virtual reality games. Learning more about Jobe, Angelo persuades him to participate in his experiments, letting him know it will make him smarter. Jobe agrees and begins the program. Dr. Angelo makes it a point to redesign all the intelligence-boosting treatments without the "aggression factors" used in the chimpanzee experiments. Jobe soon becomes smarter, for example, learning Latin in only two hours. Meanwhile, Jobe also begins a sexual relationship with a young rich widow, Marnie. However, Jobe begins to display telepathic abilities and has hallucinations. He continues training at the lab, until an accident makes Dr. Angelo shut the program down. The project director, Sebastian Timms, employed by a mysterious agency known as The Shop, keeps tabs on the progress of the experiment, and discreetly swaps Dr. Angelo's new medications with the old Project 5 supply (reintroducing the "aggression factors" into the treatment). Jobe develops telekinetic and pyrokinetic powers and takes Marnie to the lab to make love to her while in virtual reality. Something goes wrong in the simulation when Jobe's virtual avatar shapeshifts, attacking her mind directly; Marnie is driven insane, laughing endlessly at nothing. Jobe's powers continue to grow, but the treatments are also affecting his mental stability, and he decides to exact revenge on those who abused him when he was "dumb": Father McKeen is burned alive, a bully named Jake is put into a catatonic state by a mental "lawnmower man" continually mowing his brain, and a lawnmower invention of Jobe's runs down Harold, Peter's abusive father. Jobe uses his telepathic abilities to make the investigating police attribute it all to "bizarre accidents" in front of Dr. Angelo. Jobe believes his final stage of evolution is to become "pure energy" in the VSI computer mainframe, and from there reach into all the systems of the world. He promises his "birth" will be signaled by every telephone on the planet ringing simultaneously. The Shop sends a team to capture Jobe, but they are ineffective against his abilities and he scatters their molecules. Jobe uses the lab equipment to enter the mainframe computer, abandoning his body to become a completely virtual being, leaving his body behind like a husk. Dr. Angelo remotely infects the VSI computer, encrypting all of the links to the outside world, trapping Jobe in the mainframe. As Jobe searches for an unencrypted network connection, Dr. Angelo primes bombs to destroy the building. Feeling responsible for what has happened to Jobe, Angelo then joins him in virtual reality to try to reason with him. Jobe overpowers and crucifies him, then continues to search for a network connection. Peter runs into the building; Jobe still cares for him and allows Dr. Angelo to go free to rescue Peter. Jobe forces a computer-connected security door to open, allowing Peter and Dr. Angelo to escape. Jobe finally escapes through a maintenance line before the building is destroyed in multiple explosions. Back at home with Peter, Dr. Angelo and Peter's mother Carla (who has become a romantic interest) are about to leave when their telephone rings, followed by the noise of a second, and then hundreds of telephones ring, all around the globe. The plot of Stephen King's 1975 short story "The Lawnmower Man" concerns Harold Parkette, who hires "Pastoral Greenery and Outdoor Services Inc." to cut his lawn. The serviceman who arrives to do the job has a lawnmower that mows the lawn by itself while he crawls, naked, behind the mower, eating the grass. The serviceman himself is actually a satyr who worships the Greek god Pan. When Parkette tries to call the police, the mower and its owner ritually kill him as a sacrifice to Pan. The film's original script, written by director Brett Leonard and producer Gimel Everett, was titled Cyber God and had nothing to do with King's short story. New Line Cinema held the film rights to King's story, and decided to combine Cyber God with some minor elements of King's "The Lawnmower Man". The resulting film, originally titled Stephen King's The Lawnmower Man, differed so much from the source material that King sued the filmmakers to remove his name from the title. 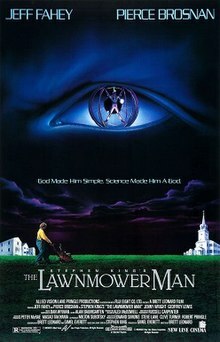 After two court rulings in King's favor, New Line still did not comply and initially released the home video version as Stephen King's The Lawnmower Man. On King's official website, the film is not listed among the films based on his work. The Lawnmower Man was released in Japan under the title Virtual Wars; Fuji Creative's Masao Takiyama is also credited as a co-producer. References to the short story include the scene where Jobe kills Peter's father with the lawnmower "Big Red", the aftermath in which the police state that they found some of his remains in the birdbath, and the name of Terry McKeen's company, Pastoral Greenery. The film has several elements in common with the 1959 Daniel Keyes novel Flowers for Algernon, which also deals with a mentally disabled man whose intelligence is technologically boosted to genius levels. The computer-generated imagery (CGI) was created for the film by Angel Studios. The supervising sound editor was Frank Serafine, who was hired as a result of his sound creation work in the 1982 film Tron. Some of the computer-generated scenes were used in Beyond the Mind's Eye, a video in the Mind's Eye series. As of July 2018[update], the film held a 34% rating on Rotten Tomatoes based on 38 reviews with the consensus: "The Lawnmower Man suffers from a predictable, melodramatic script, and its once-groundbreaking visual effects look dated today". The movie debuted at number two at the box office with $7.7 million in its opening weekend behind Wayne's World. It went on to gross $32.1 million domestically, making it a moderate financial success against its $10 million budget. A sequel Lawnmower Man 2: Beyond Cyberspace was released in 1996. It was retitled Lawnmower Man 2: Jobe's War for its video release. The film received negative reviews from critics and fans of the first movie. The film spawned two video games: The Lawnmower Man in 1993, and Cyberwar, in 1994. Comic book writer Grant Morrison said in an interview that he was contacted by the owners of the Lawnmower Man in 1995 and asked to write treatments for Lawnmower Man 2. Morrison claims he was asked to "bend the Lawnmower Man series in an X-Men superhero-type direction." Neither of Morrison's script treatments was used and Lawnmower Man 2: Beyond Cyberspace was produced without his involvement. Some of the CGI footage of The Lawnmower Man was featured in Beyond the Mind's Eye. Jaunt VR, a virtual reality studio, is adapting the feature into a virtual reality experience with the original rights holders. The theatrical version of the film was initially released on VHS and Laserdisc on August 26, 1992. Alongside the 108-minute theatrical version, New Line Home Video also released an unrated director's cut running 141 minutes on VHS and Laserdisc. The success of the unrated version alerted King to New Line's continued defiance of the order that his name be stricken from the film's credits and all marketing as the back covers stated "Based on a Story by Stephen King". A third court order was needed to force the studio's compliance. As before, the court upheld the two prior judgments, but it took the extra step of imposing a penalty of $10,000 directly payable to King for every day New Line remained in contempt by defying the order. Additionally, the studio would have to forfeit all profits earned on the film during that same period. The film was released on VCD in 1996. The DVD, released in December 1997, contains only the theatrical cut, with scenes from the unrated edition being presented on the DVD as deleted scenes. The director's cut was released on DVD with the inclusion of the sequel Lawnmower Man 2 on October 25, 2010, in the United Kingdom, however this release suffered from poor NTSC quality transfer with the aspect ratio of 4:3 pan and scan, the extended scenes spliced-in but in the aspect ratio of 16:9. Prior to the US Shout! Factory release, Blu-ray versions of the film were only available in Italy through Minerva Pictures and in Germany under the Alive brand. The Italian release contains edited Italian credits at the beginning, which are taken from the DVD version as the difference in quality from the rest of the movie can be seen (interlaced framing notably). Shout! Factory released The Lawnmower Man on Blu-ray for the first time in the United States in June 2017. The two-disc set includes new 4k digital restorations of the theatrical and director's cuts, audio commentary with director Brett Leonard and producer Gimel Everett, an all-new retrospective documentary featuring Leonard and star Jeff Fahey, and all of the bonus features from the original New Line DVD. ^ Jones, Stephen. Creepshows: the Illustrated Stephen King Movie Guide, Titan Books, 2001, pp. 75. ^ "Ultra 64 'Dream Team'". GamePro. IDG (70): 138. May 1995. ^ "The Lawnmower Man (1992)". Rotten Tomatoes. Retrieved May 6, 2018. ^ Welkos, Robert W. (1992-03-17). "On the Ropes Columbia Execs Under Fire Over Costly Flops 'Gladiator,' 'Radio Flyer'". The Los Angeles Times. Retrieved 2010-11-18. ^ Fox, David J. (1992-03-10). "Weekend Box Office 'Lawnmower Man' Cuts the Mustard". The Los Angeles Times. Retrieved 2010-11-18. ^ Roettgers, Janko (19 January 2017). "Jaunt to Remake 'Lawnmower Man' as Virtual Reality Series". ^ "LaserDisc Database - Lawnmower Man, The: Unrated Director's Cut ". www.lddb.com. ^ "CD Films/Music". Sega Saturn Magazine. No. 12. Emap International Limited. October 1996. p. 97. ^ "Il tagliaerbe" – via Amazon. ^ "The Lawnmower Man Blu-ray". This page was last edited on 7 April 2019, at 01:48 (UTC).